(from page 4 of the 1967 Collection) This Acapulco Blue 1967 Mustang hardtop is owned by Randy Dorse of Broken Arrow, Oklahoma. Randy writes, This car is a C-code, 289 2V car, this Acapulco Blue Mustang has been upgraded to GTA specs brand new ground up restoration. It runs and drives like a new 1967 Mustang. The parts list includes: floor pans, stainless steel disc brakes, rear brakes, upper and lower control arms, 620 coils, front and rear sway bars, rear leaf springs, tires and aluminum wheels, Edelbrock shocks, 3 row radiator, Edelbrock water pump, 289 engine bored 40 over balanced hyperutectic pistons, Edelbrock cam, Crane roller rockers, comp valve job, Edelbrock carb and intake, tri-y headers, Flowmaster exhaust, Accel Billet distributor and coil, March pulleys, TCI racing transmission and torque converter, interior, seat foam, Grant steering wheel, Pioneer cd/tuner and speakers, hump hugger console, Mustang floor mats, new bolt kits and misc. bushings and floorplan plug kits, new Auburn limited slip 8 inch traction bars and sub-frame connectors. I added this summer deluxe dash and door panels and a chrome fire extinguisher. I am now working on a complete new power steering system for it. I plan on driving it from Oklahoma to California this spring on Route 66. (from page 4 of the 1967 Collection) Randy's Acapulco Blue 1967 Mustang hardtop, right side view showing off its rocker panel metal trim and white stripes, and bright wheels. (from page 4 of the 1967 Collection) Here is good shot of the grille and fog lamps of Randy's Acapulco Blue 1967 Mustang hardtop. 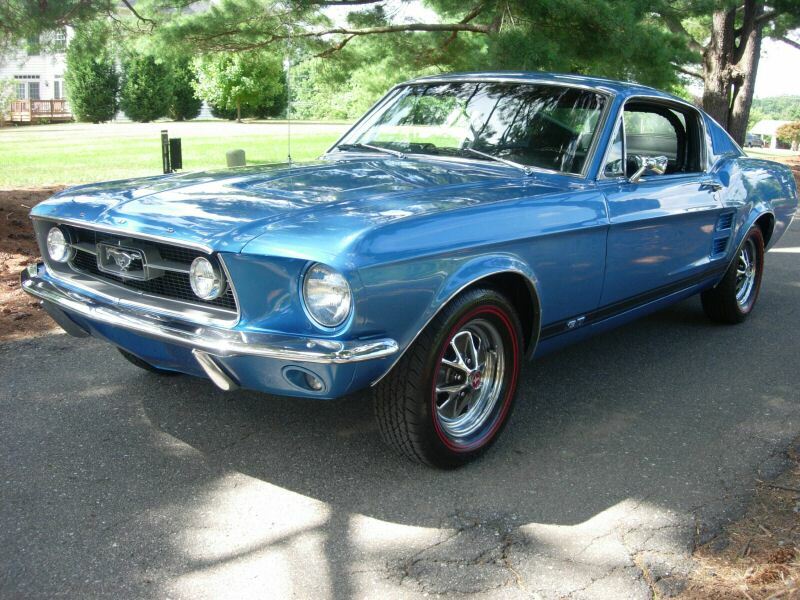 (from page 4 of the 1967 Collection) Here is another right front view of Randy's Acapulco Blue 1967 Mustang hardtop. (from page 4 of the 1967 Collection) Looks good from all angles! (from page 4 of the 1967 Collection) Here is Randy's Acapulco Blue 1967 Mustang hardtop at a car show. Randy says, I started the rebuild on this mustang in December of 2003 and it is still a work in progress. (from page 4 of the 1967 Collection) Right rear view of Randy's Acapulco Blue 1967 Mustang hardtop at a car show. (from page 19 of the 1967 Collection) Acapulco Blue 1967 Mustang GT fastback owned by Richard Rose from San Jose, California. It's our featured Attitude Of The Week for the week starting August 11, 2013. It has it's original 390ci V8 engine and a manual transmission. 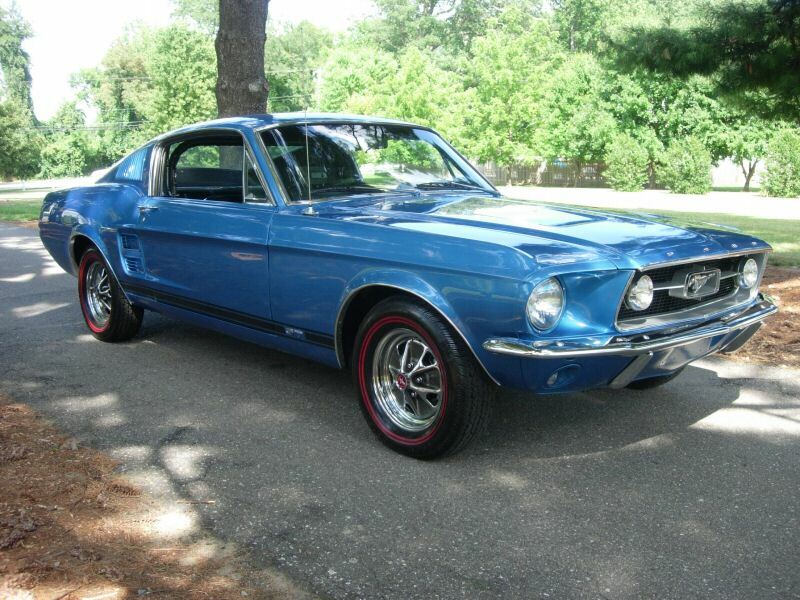 Richard adds, "Purchased new in 1967, special ordered with Competition Handling Package (1 of 141 fastbacks of 195 built). Dealer installed items; gauges, Shelby steering wheel, 427 heads, 427 dual point distributor, adjustable rocker arms, 3.89 gears, and rear mounted antenna. " (from page 27 of the 1967 Collection) Acapulco Blue 1967 Mustang Shelby GT-500 fastback with an manual transmission and a black interior. This one has white racing stripes and the big 428ci V8 engine. (from page 27 of the 1967 Collection) Acapulco Blue 1967 Mustang Shelby GT500 fastback, right side view. (from page 27 of the 1967 Collection) Acapulco Blue 1967 Mustang Shelby GT-500 fastback, left rear view. The dual racing stripes wrap right around under the rear bumper. (from page 31 of the 1967 Collection) The hood is up on this Acapulco Blue 1967 Mustang GTA (automatic transmission GT) convertible. It was on display at the 2010 Port Angeles, Washington, Mustang car show. It has steel styled wheels, louvered hood, white rocker panel stripes, fog lamps, and a V8 engine. (from page 31 of the 1967 Collection) Rear left view of an Acapulco Blue 1967 Mustang GTA convertible. (from page 35 of the 1967 Collection) This is a real 1967 Mustang Shelby GT500. It has has a 428ci V8 under the hood, Shelby front end and grille with fog lamps, Shelby rear wing, side scoops, Shelby wheels and Shelby interior. I photographed this car at the 2010 MCA Grand Nationals held in Bellevue, Washington, just down the street from where I live. (from page 35 of the 1967 Collection) Left front view of a Acapulco Blue 1967 Mustang Shelby GT-500 fastback.